We are experts in car batteries here at Kens Autos and have the latest diagnostics equipment at our Surrey and Croydon garages. 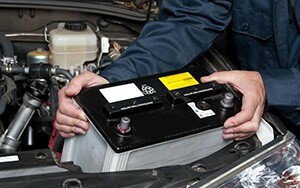 We stock a wide range of batteries, all charged and ready for fitting by our trained experts. On the rare occasion that we do not carry a specific battery, we are able to acquire the perfect part very quickly, meaning that you are never without your car for long. As each car will require a different type of battery, you will need to call us first with the details of your vehicle so we can match your battery requirements and provide a quote. You can call one of our garages directly using the phone numbers at the top of this page, alternatively you can email us via our contact page, and we will phone you back at a time that suits you best. With more than 35 years of experience, you can be sure that Ken’s Autos will provide you with the best service possible, for even the smallest of jobs. The fitting of car batteries is included, like all of the work we undertake, in our 12-month, no quibble parts and labour warranty.